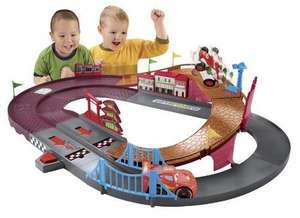 Cars 2 Shake 'n' Go Raceway. The speed and power of Lightning McQueen and Francesco is in your hands! As kids shake the cars, they'll hear phrases from the movie and it will rev the engines up. The longer they shake them, the farther they go! Set the cars off on the track and watch as the go head-to-head racing around Tokyo, Italy and London in the World Grand Prix! Kids can act out their favorite scenes from the movie Cars 2 with the two stylish and collectible vehicles included with the track - McQueen and Francesco. Kids will love watching the head to head racing action as the cars race through the key venues from around the world. The track also features the camera from the movie--turn the camera to knock cars off the track!